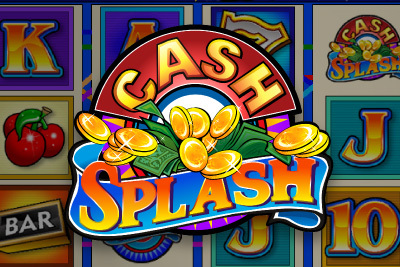 Cash Splash used to be a very popular 3 Reel classic slot, which was upgraded into its current 5 Reel video slot version. This in turn has been transformed for mobile players so we too can enjoy all this casino game has to offer. Which, you might think, isn’t really that much right? Just a fairly simple Microgaming video slot with Wild and Scatter symbols. Not even free spins or bonus rounds I hear you shout? Nope. How about a great theme and graphics? Well… it’s just your standard generic fruit machine isn’t it? Nothing to shout about. So why are we playing this mobile game? Watch the top left hand corner as that jackpot turns, turns, turns and grows, grows, grows… Yeap this is one of the few progressive jackpot mobile slots. And we all love jackpot slots don’t we? Best of all, both the classic 3 reel and Cash Splash 5 reel progressive slot games are linked to the same progressive jackpots, increasing the bonus pot drastically. We are also happy to report that the Scatter symbol has a high hit frequency, with wins multiplied by the total number of credits staked. Jackpot & Wild Symbol: The Cash Splash slot logo will substitute all symbols, except scatter. But what you are really after is to get all five symbols on the 15th payline to win the jackpot. Scatter: The scatter symbol is, rather originally, the symbol marked ‘Scatter’. Scatter wins are added to your payline wins and are multiplied by the total number of credits staked. Cash Splash mobile slot is one of the few with a progressive jackpot, now that's worth splashing out some cash for. The frequently hitting scatters and chance of the jackpot makes this 5 reel, 15 pay line Microgaming mobile slot great for a few spins wherever you are.